In a pre-season article on IL Indoor, I wrote that “If everything comes together, they [the Seals] could be a very good team but even if it doesn’t, they won’t be that bad”. I’m gonna call that a win. Brodie, Dan, and Kyle are playing very well, Garrett Billings is playing like the Billings from the Rock rather than the Billings from the Black Wolves or Stealth (not that that second Billings was all that bad), Frank Scigliano has been great, and Austin Staats is everything they hoped he’d be. They’ve won close games against the Warriors and Knighthawks, and more decisively against the Roughnecks and Mammoth. We’re a third of the way into the season and the Seals are in first place, ahead of the Rush. Can a rookie GM and coach be considered for the GM of the Year and Les Bartley award? Not sure whether it’s ever happened before but at this point in the season, Patrick Merrill has to be on the short lists for both. The Rush franchise has been to the finals in each of the last four years (and five of the last seven), winning three of them. They’ve spent most of the last four or five years as the Cup favourites, and are almost a lock to win the West division every year. But this year, they seem to have dropped a little. They are still an excellent team, make no mistake, but it’s no longer an assumption that they’re going to win the West. Could Calgary catch them once they get their offense sorted out? Maybe. Could San Diego cap off their amazing debut season by winning the west? Longer shot maybe, but not out of the realm of possibility. Last week against the Swarm, the Rush scored only two goals in the first half while allowing seven. It’s not that they just didn’t play great, I actually heard Rush fans describe their play in the first half as “terrible”. That’s just not a word that’s been used to describe any aspect of the Rush in years, let alone the whole team. While they weren’t terrible against the Rock, they weren’t great either. The fact that we can talk about the potential vulnerability of the Rush is a bit surprising, though it had to happen sometime. You just can’t be that dominant forever. That said, the Rush are known for slow starts so it’s possible they’re just finding their feet and will be back to their normal level of dominance by the end of the season. OK, this is not all that surprising. He was the #1 overall draft pick because everyone knew he could score. We knew he’d be good, but this good? He’s leading his team in goals and points and tied for second in the league in goals. He’s doesn’t even get mentioned in the discussions regarding the Rookie of the Year race – we’re all talking about who’ll finish second. The Seals have had success beyond their dreams thus far, but by their record, the Wings look more like the stereotypical expansion team. They were winless through six games before finally logging one in the win column this past weekend. But as we all said about the Roughnecks when they started 0-6 a couple of years ago, this is one of the best 0-6 teams you’ll ever see. Of their seven games thus far, the Wings have been tied in the fourth quarter of six of them, and tied or within one in the last three minutes in five. They’re having trouble putting a full 60 minutes together; they scored seven first-quarter goals in their first five games combined. In their second loss to the Rock, they figured that out and took a 6-1 lead, but then allowed the Rock to outscore them 7-2 in the fourth. With a bit of luck, they could have had a couple of wins earlier (and probably should be 2-0 against the Rock). I don’t know if the Wings will rebound the way the Roughnecks did and make the playoffs, especially considering the other teams in the East, but this is not your Ottawa Rebel / Charlotte Cobras type of expansion team. The Mammoth have essentially the same team as last season, where they finished 11-7 and comfortably in second in the West. Take out Greer, Sweeting, and Downing and add in Dan Coates (after a year off), John Lintz, and some rookies and that’s the difference. They also changed two of their assistant coaches; both guys coming in were great players with long careers and have lots of coaching experience, though none at the NLL level. So how does that translate into a 1-5 record and last place in the West? Two goals in five games for Jeremy Noble is part of it, but there’s a lot more going on here than one guy. The Rock have won six of their seven games and are leading the NLL. But they haven’t really been as dominant as you might expect a first-place team to be. They squeaked by Philadelphia twice and Colorado once, two teams who are collectively 2-11 right now. They didn’t play that well against the Rush but won because the Rush played worse. They did play well against the Swarm and Bandits in those wins, and not that bad in their one loss to the Swarm. But a win is a win, and they have six of them. Maybe these non-dominant “character wins” will help build the team’s confidence even more than the 16-7 wins would have. Now they know that if they get down early, they have the ability to come back and grind out a victory, and that will help them down the stretch. That heading is basically a lie. Nobody really thinks that adding Curtis Dickson to their lineup made the Roughnecks worse. But the fact is that the team was 3-1 and starting to really gel before Dickson signed, and then lost three straight once he returned. They beat the Warriors this past weekend and Dickson scored three goals, so while things may not be totally perfect in Rigger-land, they are certainly looking better. 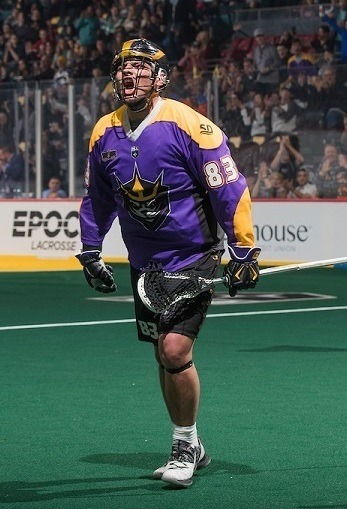 After re-signing with the Roughnecks four games into the season, Dickson only managed two goals and 9 points in his first 3 games. Those are some very un-Dickson-like numbers. But as I mentioned above, he scored three against Vancouver, and we all know that we’ll see the holy-crap-did-you-see-that Curtis Dickson before long. Similar to Staats, we knew Baptiste would be good but this good? He’s won 67.5% of his faceoffs, while last year’s leader Jake Withers is only at 66.4%. He’s also second on the team in loose balls, hasn’t taken a penalty, and has even chipped in three assists, but of course it’s the faceoffs he’s known for. We haven’t seen an NLL rookie this dominant in faceoffs since… last year. Hoggarth began the season with 11 career goals and 16 career points in 35 games, an average of 0.46 points per game. His best season was 7 points. Eight games into this season he’s sitting at 18 goals, tied for second in the league, and 30 points, an average of 3.75 points per game. He’s more than quadrupled his career best season already. Despite leading the Bandits in goals (a team containing Shawn Evans, Corey Small, and Dhane Smith), he’s still listed as a transition player. Vancouver releasing Rhys Duch happened before the season began, so I didn’t include it. I don’t find the fact that he’s having a great year as terribly surprising. I honestly thought the Warriors would be really bad this year. They’re still only 2-6 and not fighting the Seals for first place or anything, but they’ve been in a lot more games than I expected so kudos to them. After four home games, Toronto is averaging 8403 fans per game. That’s seven hundred lower than their lowest season average of 9109 in 2017, and less than half of their best season, 17370 in 2005. That average is lower than the lowest attended game during any of their first fourteen seasons. They have one of the most exciting players in the game on their roster, and they are in first place. The word “disappointing” doesn’t even begin to cover it.